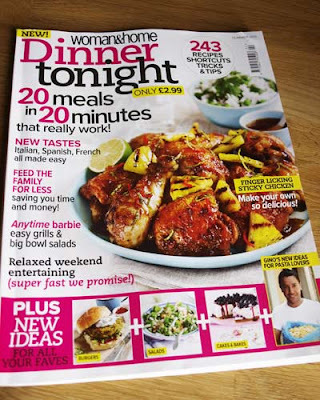 I flipped through the magazine on my train ride home and was immediately struck by Gino D'Acampo, oh yes and by his recipes too (blush). I remember when Gino was the new boy on UKTV Food's lunch time Good Food show. I no longer subscribe to Sky so don't get to see Food TV - boo hoo! But as it was the only thing I watched it wasn't good value for money. 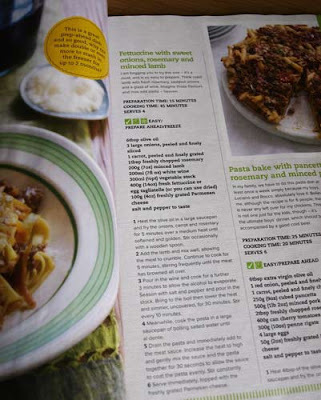 Gino has a new book out, Gino's Pasta and shared a few of the recipes in the magazine article. 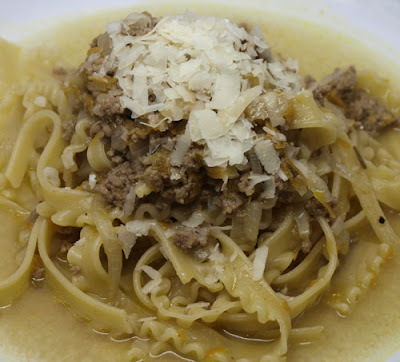 This recipe for Fettucine with sweet onions, rosemary and minced lamb struck me as something I would really enjoy. It combines lamb mince with white wine, onions and grated carrots. Now, I've always served red wine with lamb, so this recipe intruiged me. And as Gino 'begged' me to try this recipe (he did really, it says so in the mag) I would have been rude not to give it a go. Here is what my version of this recipe looked like. It was light and very tasty, I enjoyed the lack of tomatoes and we had olive bread to sop up the juices. And so does the pasta lol. Hey Janice, I love him too. It is a fabulous book. Did you see the recipe I posted from it the other day? Delicious! Oh and while I am here, I would just like to tell you, that you won my Hotel Chocolat giveaway. So much for your diet, haha! Email me your full name and address. That pasta looks lovely - I've had to virtually give up anything tomato based so always handy to discover new pasta recipes that taste great!! ooo yum. I do love Gino!